Leena Laitinen is the managing director of Finland’s national alcoholic beverage retail monopoly Alko, heading an organization of 2,400 employees and 400 stores in her authentic, people-centered style. In her words: “Leadership is interaction”. Journalist Leeni Peltonen meets up with Laitinen at Alko headquarters in Kamppi, Helsinki. It’s 8 am, and things are already in full swing. Shelves are being stocked on the basement floor of Alko’s flagship store Arkadia. The store won’t be opening for a few hours, but employees are already busy at work. A blond-haired, sporty-looking lady climbs up all six flights of stairs from the underground parking space. Managing director Leena Laitinen is a morning person. Not all Finns would jump for joy at the thought of the meeting schedule: 8 o’clock on the first weekday after Mayday celebrations. For many, the morning after the workers and students’ festivity means waking up with a dizzy head and weary body due to downing plenty of Alko’s products the day before. The streets are dotted with traces of the celebrations; a lonesome bottle of bubbly lies upside down also on the corner of Alko, situated in the Kamppi district of Helsinki. Leena Laitinen doesn’t mind the early schedule at all. This year Mayday took place in the middle of the week, and she spent it where she gets to recharge: at the summer cottage. “I chopped wood. In the summers, I also clear the forest. Saving seedlings amidst all the overgrowth brings instant rewards”, she declares, with a good measure of a genuine Savo accent. Alko’s new managing director Leena Laitinen, 46, took on the task in the fall of 2017. Almost exactly hundred days into her new role, a historic reform to the Alcohol Act was passed in Finland, when Alko lost its sole right to sell beverages with an alcohol content of over 4.7 per cent. From 1 January 2018, also grocery stores became entitled to sell stronger beer and beverages with a maximum alcohol content of 5.5 per cent. In Finland, this heralded a major change: in addition to beer with a lower alcoholic content, corner shops and supermarkets could now also sell stronger beer by smaller breweries and other alcoholic beverages. The Alcohol Act was prepared long and hard. Arguments flew for and against, discussion ranging from the reform being a human experiment to Finland being a nanny state. As predicted, the vote taken by parliament was a near tie. In the end, the more liberal line won by 98-94. Experts concerned about public health and defenders of Alko’s monopoly position lost. “Alcopop Lands at Corner Shops” and “Beer Selection Transforms”, wrote the tabloids. Alcohol has always been a hot topic in Finland. “I knew already when I arrived that the operating environment was going through a major change. The transformation goes far beyond the law reform, and it had begun long before the vote. Alko has braced itself for the change carefully and in good time, and I jumped into the process”, Leena Laitinen explains. The transformation affects both the drinking habits and consumer behavior of Finns. Total alcohol consumption has decreased throughout the 2000s. Also young people drink less. Nevertheless, alcohol is still a significant risk factor in regards to public health. A culture of drinking to get drunk is still evident on the streets and in medical statistics. As a result, the long-term alcohol policy in Finland has been – and still is – to minimize damage. The availability of alcohol has been restricted and prices have been set relatively high. At the same time, the world is changing: restrictions have been generally lifted on retail, and customer needs are increasingly segmented. Alko, too, needs to change. The new law allows Alko to keep stores open an hour longer on weekdays. Stores are now also open on Easter Saturday and Christmas Eve. It may be a small step for humankind, but it’s a big one for Finns, who so far have been tugging at Alko’s doors on holidays in vain. We don’t want to increase sales. We focus on quality instead of quantity." The sale of alcohol has always stirred emotions in Finland. Total prohibition in 1911-1932 has gradually given way to a more liberal culture. Most Finns have heard of the epic proportions attached to the day when monopoly company Alko first opened its doors after prohibition ended. There’s even a rule of thumb for remembering when it happened: 5 April 1932 at 10 am, i.e. 543210. At first glance, business seems simple: an alcoholic beverage is transferred from the store shelf into the consumer’s shopping bag. What makes Alko unique as a commercial company is that its task is not to sell as much as possible. “Alko does not attempt to increase alcohol consumption or maximize profits – instead we seek operational efficiency”, states the Annual Report. The main task is not to sell as many liters as possible, but to minimize the downsides of alcohol use. In other words, to sell a product known for its harmful health effects while aiming to prevent damages. Isn’t that an irreconcilable conflict? After just a few months at Alko, Leena Laitinen is already versed in answering this particular question. She does not deny the conflict, but does not let it get in the way, either. A focus on quality applies to products, selection, customer service, operational efficiency, and Alko as a workplace alike. Multiple channels. Service experience. Three store types. Order-delivery system. Prediction model. Assortments. Pick-up points. Consumer awareness. Environmental responsibility. Alko is a modern, agile company with years of engagement in determined development. Actually the only surprise for me when joining was to find that so much more was underway or already done than was evident from the outside , says Leena Laitinen. One of the changes underway that began before Laitinen’s arrival affects the way management is organized in stores. Where each store used to have its own manager, now service managers oversee several stores. Personnel increasingly moves between different stores. From the viewpoint of management and processes, this increases flexibility and efficiency, but it’s easy to guess that reactions among employees have been mixed. “The change has been positive on the whole, but there have been challenges”, Leena Laitinen admits. Increased responsibility and self-leadership pose an opportunity for some and a threat to others. The supervisor is not always physically present. In addition to familiar faces, there are more new people, as staff moves around between different stores. The new model unified the role and responsibilities of supervisors. Previously, a supervisor could have between 4 and 25 team members, but the numbers have now been evened out. “The new arrangement means Alko is now able to offer an increasing number of working hours, and nearly a hundred full-time positions were posted in May for internal recruitment”, Leena Laitinen mentions. The concept was initially piloted in a store in Rovaniemi, where lessons were learned. The scheme now involves as many as 90 stores. Job satisfaction among personnel took a slight dip last year, but still remains at a good level (4.05/5). Leena Laitinen has approximately 2,400 subordinates. There are 356 stores and 60 pickup points that supplement the retail network. How does one manage staff across the entire country? And how is a strategy that the management team has developed then implemented in the stores of even the tiniest towns, where clear spirit Koskenkorva is the bestseller? In Leena Laitinen’s view, a clear vision needs to underpin everything else, and goals and processes must be crystal-clear. With the right people in the right places who all know what needs to be done, they can be given space and at most “nudged along” a little. Laitinen does not believe in micromanagement. “When goals are clear, I give leeway. But if targets are not met, management tightens its grip." She mentions that “at this age” she has come to see that immediate subordinates need different types of leadership. “Some need you very close, while others would get distressed by the very thought. Leaders need to smell the air and adjust their behavior”, she says. Even if you do your best, mistakes are inevitable in management. No matter how hard you try to find the right angle, the situation can be misinterpreted. Laitinen believes in low hierarchy and approachable bosses. “Your supervisor has to be easy to talk to.” Laitinen is seen as down-to-earth and fairly predictable, which is a relief for employees. “Life is enough of a rollercoaster already without employees having to worry about their manager’s every whim”, she says. They say that the first supervisors play a key role, as they leave the strongest impression on young people. This was true also for Leena Laitinen. Back in 1996, the recent Master of Economics graduate was somewhat horrified. Leena Laitinen was about to embark on her first managerial role as a customer service manager in Kuopio, Northern Savo, in a grocery store called Pee-Ässä that was part of the S Group. She was to be in charge of 60 people. The corporate culture was safe, demanding but encouraging: goals were solid, and they had to be met. The customer was always number one. But managing director Eero Saukkonen was always there to support if – and when – it was needed. When former employees bumped into him years later at Kuopio market, they would often give him a hug, which shows how good the team spirit was at the workplace. “I was incredibly lucky to learn working for him”, says Leena Laitinen. Leena Laitinen was ambitious already then. She will never forget a mistake she once made during the strawberry season. She was responsible for adjusting the fruit scales. The price of strawberries went up, but the scales still printed out tags with prices from the day before. All day, the shop sold the key seasonal produce at a discounted price. Laitinen’s supervisor took a deep breath in the evening. “I still remember how to adjust the scale”, Leena Laitinen grimaces. Leena Laitinen gives quick and precise answers. Only once during the interview does she pause to stare at the corner of the ceiling for a moment: as she is asked when she knew she wanted to become a manager. In Estonia, Laitinen worked as the country manager for SOK, for instance in charge of overseeing and expanding Prisma hypermarkets. Already before her years in Estonia, a number of lucky coincidences pointed the way ahead. One of the decisive moments was when Laitinen was studying nutritional sciences after her economics degree, and noticed that S Group was looking for young people for a retail training program. A keen doer has always had plenty to do. During her eighteen years at SOK, she advanced to Executive Vice President for Consumer Goods. 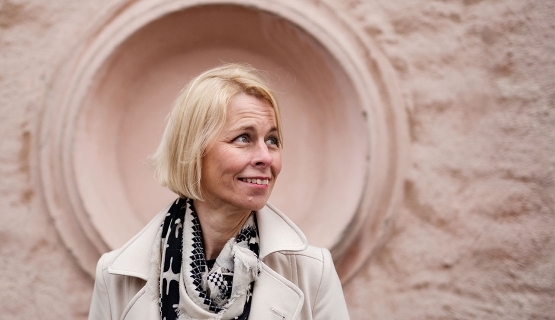 She then held the position of Managing Director at Snellman Group before joining Alko. Her background in consumer goods gives her a solid grasp of the sector to which mild alcoholic beverages are increasingly shifting, which seems to be a clear advantage. For a person eager to learn, there’s been no shortage of study options. Laitinen has been tested and prepped at numerous courses, for instance at the SOK Institute in Jollas, Helsinki, and several Swiss IMD management and strategy courses. She has also received mentoring and been a mentor herself. Leena Laitinen identifies the closest with authentic leadership, a theory that has been talked about a great deal lately. Personality forms the cornerstone of authentic leadership. Integrity and being yourself means using your own personality as a tool. Above all, it’s about knowing oneself. Identifying personal emotions, behavior, strengths, and weaknesses plays a key part in developing as a leader. I have a partner for mirroring myself against in the management team, who has a very different personality to mine." But personality can be steered towards a better direction for leadership, and one’s conduct needs to be improved continuously. Personal conduct needs to be consciously mirrored all the time: how is communication going, what went wrong. Recently, Leena Laitinen did hear back from her management team member that things hadn’t gone too well and her communication had been unclear. Laitinen likes things to progress. Sometimes speed can turn into impatience, but age has a smoothing effect. However, Leena Laitinen thinks that for her the most important leadership lesson has not come from a leadership retreat but from another place altogether – home. A safe childhood as the youngest of four siblings from Juankoski, in the heart of Savo, gave the best possible starting points to being herself. The youngest of the pack was included in everything, and the siblings did things together, which taught to share and negotiate. The forest is Leena Laitinen’s favorite place, which is another legacy from her childhood home. Her father was a timber buyer in the Northern Savo and Kainuu areas of Finland. Her brothers have degrees in forestry, and the whole family used to go picking berries and mushrooms in the forest. As a young girl, Leena would often draw pictures of timber trucks. These days, she chops firewood at the summer cottage and goes running several times a week near her home in Tuusula. As an avid runner for many years, Laitinen’s latest hobby doesn’t come as a surprise: orienteering. Next summer, she will be taking part in the 25.7-kilometer Venla Relay as part of a four-member women’s team. But as a director of major policies, Leena Laitinen is eager to leave her personality aside and move on to discussing strategy. We return to Alko’s core task, responsible alcohol retailing. She straightens her posture. Alko’s buyers are sought-after guests around the world, as inevitably when the monopoly buys it buys extensively. Alko can have a genuine impact on the purchase chain, especially in its collaboration with Nordic alcohol retailers. The trend for non-alcoholic beverages is a global phenomenon, last year their share overtaking that of champagne when measured by liter at Alko. Meanwhile, wine producers are putting consumer wishes for milder wines into practice. An interest in origins is another megatrend. The transparency of the purchase chain plays an increasing role also for Alko. Another example of responsibility on a day to day basis is the way ID is increasingly checked at Alko cash registers – as often as every three seconds. Mystery shoppers are now being employed. They resemble regular customers, but report any deficiencies to their commissioner, Alko’s management. It is one way to verify that alcohol is not sold or passed on to those under age. But Alko’s most important responsibility relates to minimizing the harmful effects of intoxicants. It is an area where there is certainly plenty of work to do, as the damaging health and social effects of alcohol use are vast. Probably not one single family exists in Finland that would not be affected by excessive use of alcohol in some way. Partnership initiatives for instance with child welfare organizations and sports associations serve as reminders that even moderate use of alcohol can be distressing for children, let alone heavy drinking. Leena Laitinen mentions a play called Fragile as an example of a recent project, which illustrates a childhood overshadowed by alcohol abuse, as well as the praised Lydia adventure game, which paints a grim picture of a child’s experiences of the harmful effects of alcohol. The game developers had personal experience with the issue. “Instead of preaching, we use modern ways to talk honestly about tragedies caused by alcohol abuse”, says Leena Laitinen. Another example of social responsibility is the associate professorship in addiction medicine donated by Alko to the University of Helsinki. Laitinen has a background in retail, with customers and their everyday needs at the heart of business. Service experience is what creates competitive edge also for Alko in a world where everything can be done digitally, without people and interaction. The selection includes more than 7,500 products, the largest store stocking about 3,000. The offering depends on the store; products at the Muonio store in the northernmost part of Finland differ from the store along leafy Esplanadi street in Helsinki. The number of customer visits totals 58 million per year. Alko has every reason to be proud, as it has taken the number one spot in a customer service quality survey for the sixth consecutive year. Alko’s operating culture has transformed over the last few decades: before, the salesperson would hand a bottle across the desk – the one the customer knew to ask for. Now sales personnel know what to recommend as an accompaniment to any food and situation possible – whether to go with asparagus on a wedding anniversary, as a present for one’s mother-in-law, or a reasonably priced boxed wine for a buffet meal. Of all operators in the service industry, only the library has ranked higher than Alko. According to today’s standards, also Alko has multiple channels: it develops its webstore and has a flexible ordering platform. Online orders are delivered to pick-up points for instance in connection to a kiosk or the post office. Despite the new Alcohol Act reshuffling the sales statistics of a few product categories, all beverages with an alcoholic content over 5.5 per cent are still purchased at Alko, unless brought from abroad, from cruises for instance. The main change brought on by the reform seems to have been the sales of the favorite drink of many Finns, a gin-based long drink diluted with grape lemonade, which rapidly transferred from Alko to the grocery stores. At Alko, sales of the long drink fell by 40 per cent in an instant. Those who advocate dismantling Alko’s monopoly position are already envisaging the next step; wine being sold at grocery stores. Alko is clearly not too excited about the thought, but does not fret, either, as it trusts its service quality as a competitive advantage. No food store would be able to offer such a wide selection of products. The interview has reached its end, and Leena Laitinen heads briskly to her next appointment, naturally taking the stairs. It’s time for the management team meeting. At 10 am, the store on street level has now opened its doors. The abundant offering makes it clear that we are in the flagship store. If you cannot find what you are looking for, you probably don’t need it – or you can order it online. The Beer Corner, Whiskey Island, and Sparkling City downstairs serve the most exacting customers. Priced at EUR 3,045, the most expensive champagne to be glimpsed hails from the Krug vineyard. Perfectly in line with Laitinen’s description of current trends, a presentation and tasting of a non-alcoholic German wine is taking center stage right now. The friendly sales person talks highly about a non-alcoholic Riesling, describing the production process and characteristics. With the amount of residual sugar as high as 40 grams per liter, it’s perfectly suited for a barbeque or to complement oriental food. The machine for returning empty bottles is in busy use today. Finns top the charts for recycling bottles, returning 90 per cent, i.e. 4 billion beverage packages, each year. Plastic bags are still around, but progress is underway with Alko’s strategy outlining that plastic bags will be a thing of the past by 2020. Aalto EE offers a wide variety of programs for executives and managers. Read more about our Degree Programs and Leadership and Strategy programs.